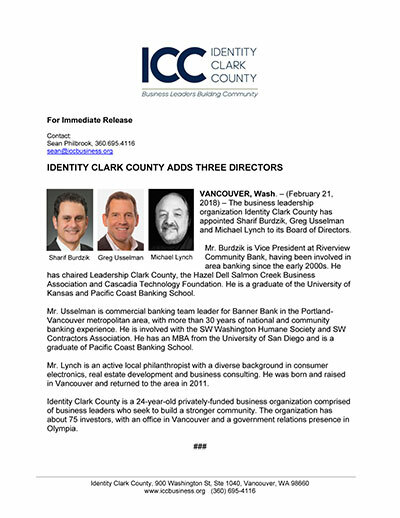 The business leadership organization Identity Clark County has appointed Sharif Burdzik, Greg Usselman and Michael Lynch to its Board of Directors. Mr. Burdzik is Vice President at Riverview Community Bank, having been involved in area banking since the early 2000s. He has chaired Leadership Clark County, the Hazel Dell Salmon Creek Business Association and Cascadia Technology Foundation. He is a graduate of the University of Kansas and Pacific Coast Banking School. Mr. Usselman is commercial banking team leader for Banner Bank in the Portland-Vancouver metropolitan area, with more than 30 years of national and community banking experience. He is involved with the SW Washington Humane Society and SW Contractors Association. He has an MBA from the University of San Diego and is a graduate of Pacific Coast Banking School. Mr. Lynch is an active local philanthropist with a diverse background in consumer electronics, real estate development and business consulting. He was born and raised in Vancouver and returned to the area in 2011. Identity Clark County is a 24-year-old privately-funded business organization comprised of business leaders who seek to build a stronger community. The organization has about 75 investors, with an office in Vancouver and a government relations presence in Olympia.